NYC Public School Parents: Is there a connection between the Common Core and data privacy violations? Is there a connection between the Common Core and data privacy violations? inBloom was sold to states and districts and still is being justified by NY State as helping kids become “college and career ready,” and its interoperable instructional tools were supposed to be be aligned with the Common Core. It is clear, in any case, that having the same common standards and tests across states would simplify the task of comparing and collecting student data, and that the feds wanted to encourage this data collection and sharing through their revisions of FERPA and via their grants for state longitudinal data systems provided by the fiscal stimulus funds and Race to the Top. PARCC and SBAC are the two Common Core testing consortia that were established with federal grants. Here is a list of PARCC states , including New York (though I believe Indiana Florida and Pennsylvania have now pulled out.) Here is a map of the SBAC states. So I wrote the people at the Data Quality Campaign, funded primarily by the Gates Foundation, which is now running the counter-campaign on privacy and holding webinars with other Gates grantees like the National PTA, in a desperate attempt to convince parents that they have nothing to fear from the Common Core or student data collection. 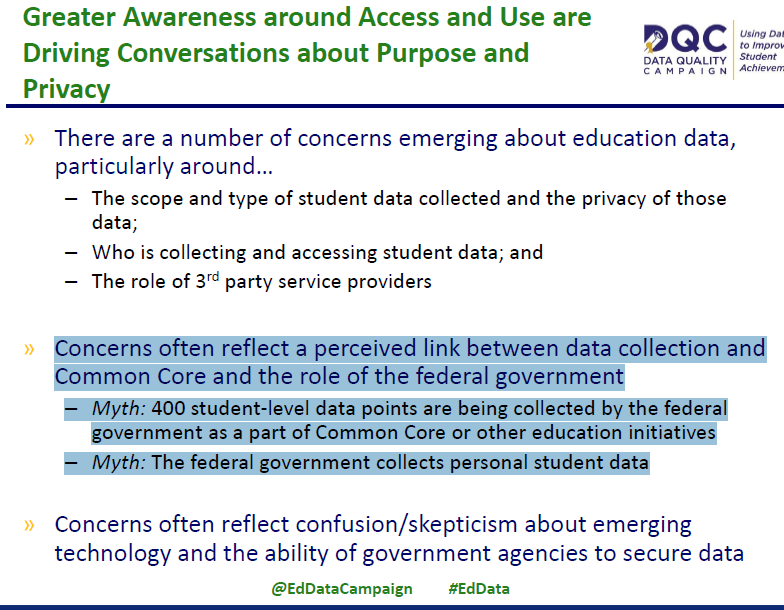 So I asked the DCQ directly about the clear statements in the US Ed Department contracts with PARCC and SBAC which seem to contradict their claim that the federal government has no intention of collecting personal student data. 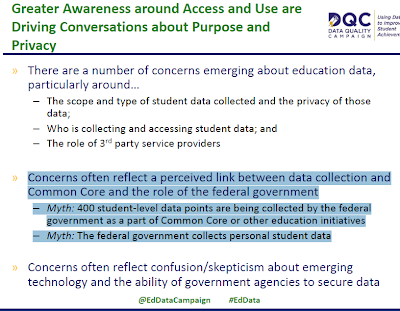 MYTH: The two consortia of states developing new assessments aligned to the Common Core State Standards are required to provide individual student data to the Federal government. FACT: The Department does not, and will not, request or collect personally identifiable information (PII) from the consortia and it is not legally authorized to create a student-level database. As stewards of the taxpayers' funds, the Department collects basic project information—such as aggregate research results, but not PII—to evaluate the progress the grantees are making. You can go to this website directly at http://www.ed.gov/k-12reforms/standards. USED will collect the same aggregate data, originally authorized under NCLB to determine AYP by school, for non-common core states like TX and VA as it will for states whom have adopted the standards (e.g., MD, ID, etc.). This same aggregate level data will be collected for states whom have adopted the standards but are choosing a separate (i.e., non-consortia) assessment including GA and OK. I encourage you to join our next two webinars and the 3rd one in particular which will include officials from the U.S. Department of Education to address these very concerns. My understanding is that both SBAC and PARCC governing states are working on data privacy language and I encourage you to check out their websites for the most recent statements they have made on this topic. And yet these statements do NOT bar the federal collection of PII data, they just say that this particular law does not authorize this. You guys have a BIG problem on your hands. I had believed previously that the connection between the Common Core, inBloom and federal data collection was tenuous, but this language in the consortium contracts makes it clear that what the Gates foundation and US Ed Dept had in their heads the whole time is exactly what the critics have made it out to be. Until and unless those contracts w/ PARCC and SBAC are changed to specifically bar their sharing PII data w/ the feds, no one is going to believe a word you say on this issue. I also strongly urge you to come out with a position on parental consent quick, unless you are prevented from doing so because of your financial connections to Gates etc. That’s why we are excited about the Education Data Initiative, an Administration-wide effort to “liberate” government data and voluntarily-contributed non-government data as fuel to spur entrepreneurship, create value, and create jobs while improving educational outcomes for students. Could this data mining be a way for govt officials to leak private info to people for personal gain? There's evidence that the CIA & the Executive branch have done it for years. "Senator Charles E. Grassley is examining whether Education Department officials disclosed confidential government information to hedge fund managers, including the well-known stock picker Steve Eisman." What's the REAL reason states are being forced to use CC & PARCC?